Grammar in Practice 2 provides grammar practice in a simple and accessible format. It has 40 units of quick grammar exercises for adults at elementary level. Regular test sections give learners the opportunity to revise what they have learnt. The book is small and easy to carry so learners can choose when and where they want to study. 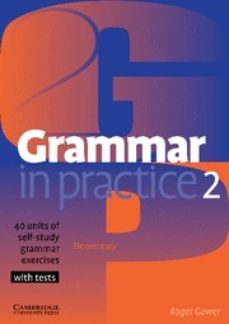 Grammar in Practice: • has enjoyable exercises with real-world situations familiar to adult learners • is clearly illustrated to help clarify meaning and so build confidence • has clear grammar models and a full answer key for the assurance of easy reference.